Exchanging time for money is a basic economic activity. It underscores every transaction. You go to work and exchange your time and labor for a salary. You’re tired on the way home, so instead of cooking, you exchange money for the time and labor of a fast-food worker. You want to go out to dinner with your partner, so you give money to a babysitter in exchange for leisure time. We make these exchanges all the time, usually without thinking too carefully about them. But, for most people, particularly young people, the biggest reserve of capital you have is your available time. That’s why it’s important to budget it accordingly. If you’re considering a freelancing project, negotiating a salary or hiring an assistant, these calculations are fairly obvious. However, there may be other circumstances where a slightly more nuanced approach is justified. How do you decide how much your time is worth? Well, there are a few ways. If you’re employed, you can use your hourly wage as a baseline. If you’re relatively satisfied with both your work and your salary, that’s a pretty good estimation of what your time is worth. You could also use a maintenance calculation. 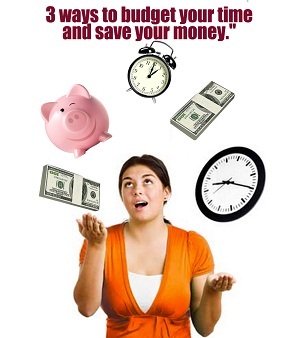 Figure out how much you need to earn to break even each day, counting all your bills and saving for the future. Then, divide that by 8 or 10 for the number of hours you think you should be working. That’s what an hour of your labor is worth, at a minimum. Couponing is one of the traditional tenets of frugal living. Veteran shoppers pore over weekly circulars looking for discounts on everyday items. They create extensive databases listing weekly sales and specials. They find, clip and organize dozens of tiny slips of paper. These activities reflect a considerable time investment. Between research, planning, organization and storage, couponing could easily take 10 hours a week. The result for that savings? Very successful couponers might save $90 a week. That works out to $9 per hour. Would you take a job earning $9 per hour? Given the flexibility of hours, the ability to work from home and the relative ease of the task, perhaps you might. It’s a mistake, though, to think of that $90 as “free money.” It’s actually the result of significant labor. 2.) Shop at a second-hand store? It takes quite a bit of extra time to go thrift store shopping for things you need. These stores can be poorly organized, so it may take time to find anything. You’re going to walk away empty-handed quite often. If you have to make one shopping trip a week, it might take an hour of your time. If you can find something you need there, though, the savings can be considerable. Let’s imagine some numbers. Suppose you need a new dresser. A new one from a furniture store might cost $200, but you can easily find one at a thrift store for $50. That’s “earnings” of $150. If you have a successful outing like that once a month, you’re spending 4 hours to earn $150. That’s a little more than $37 an hour. Spending an hour a week at the thrift store might not be such a bad idea! 3.) Manage your own retirement fund? Keeping up with investing can be a hassle. In order to make the most of your money, you need to stay abreast of financial news and developments. Unlike most tasks, this one also requires a considerable up-front cost in terms of time. There’s a vocabulary to learn and quite a bit of research to be done before wading in. It might take you 4 hours a week of reading and studying just to master the fundamentals for a month. Add another 2 hours a week after that for checking news and staying current on the markets. Your first year, you might spend 160 hours developing your skills as an investor. The cost savings, on the other hand, could be significant. The median retirement fund is about $101,630. A fee-based advisor would charge 2% annually to manage those funds, which in the first year would be $2,020. In the first year of investing, you’d be “making” $12.70 for managing your own retirement funds. After the initial investment, your “salary” – assuming fees stayed the same – would be just over $19. There’s obviously much more to the decision to begin an activity than the money per hour. There’s also your personal capacity, the time it adds (or subtracts) to family or leisure time, and the extent to which you enjoy the activity. It’s worthwhile to remember that you’re not always better off doing it yourself and that your time has value. Spend it wisely; it’s the most important asset you have.